ZhenHua Oil actively integrates into the local communities of each host country, participates in various social and public welfare undertakings, develops itself to drive the local economic advancement, and earnestly exercises social responsibility. It has built harmonious, trustworthy and win-win cooperation with local governments and communities. Kazakhstan KAM Oilfield donates to welfare funds like IGLIK and Demeu, as well as the government budget, to support and sponsor social development and government activities, including harnessing River Cher, which is mother river of the City of Kyzylorda, reconstruction of flood control dams each summer, construction of parks and boulevards in Kyzylorda City, etc. Iraq’s Ahdeb Oilfield made a full donation for the construction of a 3.2 km-long main road from Ahrar to Kut, built a steel bridge for Ishbiliya Village using the company’s tubular products, steel plates and experienced welders, and donated a multi-functional room for doctors in the county, etc.. From November 19, 2012, Ahdeb Oilfield supplied the liquefied gas to local residents and fulfilled its commitment to ‘being eco-friendly and bringing benefits to people’s livelihood’. The Pakistan Baska and Bahawalpur East Project allocates social welfare fees and training fees each year to support the local development of clean drinking water, health and education. In 2014, the Yenangyaung and Chauk Project donated in Myanmar a total of 57 million Kyat for the construction of local roads, water wells, pipelines, water tanks, etc.. The Kazakhstan KAM Projct strongly encourages local employees to attend a variety of Kazakh language classes and competitions, and often donates such school supplies as computers, books, stationery and sports accessories to local schools. Ahdeb Project helped the Administration of Education of Wasit Province establish Women’s Illiteracy Eliminating Center, donated prizes to the City of Ahrar to reward outstanding schools and teachers, and gave support to Shams Al-Muhaba Primary School to install water pumps. From 2012 to 2014, Yenangyaung and Chauk oilfields have donated to construct local schools and hospitals. The Kazakhstan KAM Oilfield has established social welfare funds for local patients, dropouts and the lonely aged people. Ahdeb Oilfield cooperates well with local organizations to donate facilities and living supplies to AL-WAFAA Nursing Homes in the City of KUT. 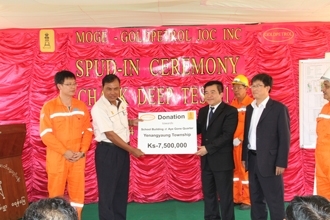 In September 2012, the Yenangyaung and Chauk oilfields donated money to flood-affected areas in Myanmar to purchase foods, medicines, drinking water and other necessities. Gbeibe Oilfield always donates money and materials for local residents to enhance their cultural undertakings or improve the public facilities through the government and social public welfare organizations. In 2010, Pakistan suffered serious floods. Baska and Bahawalpur East Project donated 1 million Rupees for reconstruction, in addition to tens of thousands of Rupees directly to temporary employees of the branch company who were affected by the disaster.